I had the recent honor of being interviewed by Sister House for their ‘Dressing Room‘ feature. If you’d like to learn more about my fashion influences and my take on style, please take a look! Sometimes I feel I am risking my life when I step out. Do you ever feel that fear? Sadly, there are those who have lost their life when they went out. Nothing makes me angrier than someone getting hurt because of who they are. Do you ever feel that anger? 2017 has been the deadliest year yet for the transgender community. I am sharing a portion of a post that originally appeared on Human Rights Campaign’s website. It is a frightening and devastating article to read, but we need to. Mesha Caldwell, 41, a black transgender woman from Canton, Mississippi, was found shot to death the evening of January 4. The murder is still under investigation and no suspects have been arrested. Jamie Lee Wounded Arrow, 28, an American Indian woman who identified as transgender and two-spirit, was found dead in her apartment in Sioux Falls, South Dakota. A suspect, 25-year-old Joshua Rayvon LeClaire, has been arrested and charged with murder and manslaughter in connection with her death. JoJo Striker, 23, a transgender woman, was found killed in Toledo, Ohio, on February 8. Striker’s mother, Shanda Striker, described her as “funny and entertaining” and said her family loved her deeply. Tiara Richmond, also known as Keke Collier, 24, was fatally shot in Chicago on the morning of February 21. A transgender woman of color, she was found dead on the same street as two other transgender women that were killed in 2012. Chyna Gibson, 31, a Black transgender woman, was shot and killed in New Orleans on February 25. Chyna was a much-loved performer in the ballroom community who was visiting friends and family in New Orleans at the time of her death. Ciara McElveen, 26, a transgender woman of color, was stabbed to death in New Orleans on February 27. McElveen did outreach for the homeless community. As of February 28, 2017, HRC has tracked at least nine murders of transgender people in Louisiana since 2013. Jaquarrius Holland, 18, was shot to death in Monroe, Louisiana, on February 19. One friend, Chesna Littleberry, told Mic that Holland was “like a younger sister” and had helped her learn to accept herself. Alphonza Watson, 38, was shot and killed in Baltimore, Maryland, on March 22. Watson’s mother said her daughter was “the sunshine of our family,” a “caring, passionate” person who loved cooking and gardening. Chay Reed, 28, a transgender woman of color, was shot and killed on April 21 in Miami. Reed’s longtime friend told Mic about their longtime friendship — describing her as someone who was full of life and beloved by many. Sherrell Faulkner, 46, a transgender woman of color died on May 16, of injuries sustained during an attack on November 30, 2016 in Charlotte, North Carolina. Police are treating the assault as a homicide. No arrests have been made at this point. Kenne McFadden, 27, was found in the San Antonio River on April 9. Police believe she was pushed into the river, which runs through downtown San Antonio. A high-school friend of McFadden described her to local media as assertive, charismatic and lovable. No arrests have been made, but police said they have a person of interest in custody. Kendra Marie Adams, 28, was found in a building that was under construction and had burns on her body on June 13. Police have charged Michael Davis, 45, with Adams’ murder. Adams also went by Josie Berrios, the name used in initial media reports on her death. Ebony Morgan, 28, was shot multiple times in Lynchburg, Virginia, in the early morning of July 2. Morgan was transferred to a local hospital where she succumbed to her injuries. Authorities have named Kenneth Allen Kelly Jr. as a person of interest in the case. Gwynevere River Song, 26, was shot and killed in Waxahachie, Texas, on August 12. According to their Facebook profile, they identified as “femandrogyne” and a member of the bisexual community. Kiwi Herring, 30, was killed during an altercation with police on August 22 during an altercation with her neighbor. Relatives told Huffpost the neighbor was transphobic and that excessive force by police led to her death. Derricka Banner, 26, was found shot to death in Charlotte, North Carolina on September 12. Friends describe Banner as a “playful spirit” and “go-getter” who enjoyed life. Ally Steinfeld, 17, was stabbed to death in Missouri in early September. Three people have been charged in her murder. Steinfeld’s family said Ally “sometimes” identified as female on social media. Candace Towns, 30, a transgender woman who was found shot to death in Georgia. Town’s friend, Malaysa Monroe, remembers Towns’ generosity. “If I needed anything she would give it to me. She would give me the clothes off her back,” Monroe said. When we lose a member of our community, it reminds me of how important it is that we keep going out. To remain visible in the public. To be in our communities. To be understood. To be tolerated. To be accepted. To be loved. We will get there. I hope. Do you ever feel that hope? This month marks the four year anniversary of the MN T-Girls! I remember the very first MN T-Girl meeting at Cafe Southside in Minneapolis. I arrived a little early and wondered if anyone would show up. But a few people did, and now, 4 years and a whole lot of eyeliner later, the group is still going strong with close to 200 members. When I started the group, I had a goal of helping other t-girls find the courage to go out, have fun, make friends and experience life outside of their living room. I also wanted to help us become visible to the rest of the world. To show people that we are real and are more than how we are portrayed in movies. I’d like to think that these goals are being accomplished. At almost every monthly event, there is usually at least one t-girl out for the first time. Almost all events are out in public, whether at the mall, in a restaurant or museum. I am also seeing increased tolerance, acceptance and love from the real world. Whether it is the group being invited for a private shopping event, a play or simply someone telling me that they love my dress. I like looking back at how things have evolved, and I also like to celebrate! Yesterday was the monthly MN T-Girls outing and it was truly special. Yesterday’s event was actually comprised of three separate moments. The first was an amazing combination of our history and of our future. The University of Minnesota recently unveiled an exhibit documenting the history of the transgender and non-gender conforming community with a special emphasis on Minnesota’s role and community. The exhibit, titled ‘In Their Own Words’: The Tretter Transgender Oral History Project is an amazing collection of literature, newspaper articles, photographs and interviews. I was excited to see the exhibit and thought it’d be interesting and important for the MN T-Girls to visit. I think history is so important. I have the freedom to walk through Target in heels but I can’t forget those activists who fought for this freedom. Typically, the museum is not open on the weekends, but thanks to the U of M’s kindness, they opened for our group for a special weekend showing. I cannot thank the U of M enough for their flexibility. What made the visit extra-extra-extra special was our tour guide was Andrea Jenkins, the curator of the exhibit and the first out transgender person of color elected to public office in the United States! Jenkins will represent Ward 8 on the Minneapolis City Council next year. I learned a lot about our history, such as when the term ‘transgender’ was first used, how different ethnic groups have had multiple genders for a very long time, and how the U of M was the second university in the United States to perform a gender reaffirmation surgery. It was an amazing exhibit and I am still stunned by the courage of those who came before us. Again, special thanks to Ms. Jenkins and the U of M! We had dinner reservations but there was a little time to kill before then. A small group of us went to Midwest Makeup Supply in Minneapolis to do a little shopping. The MN T-Girls had a private makeup event there earlier in the year and it’s always fun to visit. After the exhibit and shopping it was time to eat! We had a wonderful meal at PUBLIC kitchen + bar in Saint Paul. We had dined there two years ago and like last time, we had delicious food and wonderful service. I can’t wait to go back! It was a fun day and I cannot thank Andrea, the U of M, Public and Midwest Makeup enough for helping make the day special. I also want to thank every member of the MN T-Girls for helping the group grow and making the group what it is. Onto the next four years! This month marks the fourth anniversary of the MN T-Girls. As time passes I tend to look back more and reflect on how much things have changed, how far things have progressed or, in some cases, regressed. At its heart, the MN T-Girls exists as a social and support group. I wanted to create a group that socialized, that went out and did everyday things, such as having a nice dinner or going to the mall. It is a group where one can feel safe when going out into the real world. Many of us felt a mixture of emotions the first, or even the fiftieth time we left the house presenting as the gender we identified as. I knew those emotions because I felt, and sometimes still do, feel them. For years I was afraid to leave the house. What was I afraid of? A million things. Afraid of my car breaking down and being stranded somewhere. Afraid of being recognized, afraid of being harassed, threatened, laughed at, or worse. I was afraid I was not beautiful. There is a vague, unattainable goal of “passing” for some in our community. Passing is when we, as transwomen, are seen as cis-women. Although I can have flawless makeup and wear a beautiful dress, I still have wide shoulders, large hands and a deep voice. In short, I have many physical characteristics that are normally associated with men. Some of us want to pass because it’s validation and confirmation that our presentation is so amazing that most people would think we were born as females. Some of us look at passing in a desire to be unrecognizable to people that we know who might see us. Some of us just want to pass because it means we are as beautiful as the gender we identify as. But passing is unattainable and vague, and it’s unattainable because it is so vague. There is not a set of standards that one has to meet in order to be female, or to be beautiful. Yes, I am tall (I am even taller in four inch heels), and height is often viewed as a male characteristic and thus “gives me away”. But I have met cis-women who are taller than me. I have met cis-women who have deeper voices than myself. I have met cis-women with facial hair. Are they not women because of those characteristics? What decides what is feminine? Who decides what is beauty? Who decides who is beautiful? It’s not for anyone else to decide. Once I realized that there was no such thing as passing, that there is no standard I had to meet in order to be beautiful, then my whole world change. I was ready to go out. I was still nervous about the same things as before, with the exception of not feeling beautiful enough. Instead of striving to pass, I wanted to blend in. I did my best to blend in the first time I went out, which was about six years ago. I was still learning makeup but my confidence was growing with each day. I was tired of sitting around my living room and was ready to get out into the real world. So, one Friday morning I woke up, did my makeup, got dressed and left the house. The photo on the left is what I wore when I went out for the first time…a cute skirt, a colorful top, cardigan and black stockings. I thought it was a perfect outfit for running errands. For the next few months, I picked out outfits that, in my opinion, helped me blend in. Blending in, I thought, was a form of protection. There are those who have a fear and hatred of people who identify as transgender, and I didn’t want to draw a lot of attention to myself, lest I became a target for ridicule, violence, or worse. Blending in became a sort of camouflage, in a way. As I went out on a more regular basis, I realized that the world wasn’t as scary as I thought it would be. If I was being laughed at and pointed towards, I didn’t notice it. People were kind to me. People complimented my outfit or the skill I had when it came to walking in heels. My confidence grew. My self-esteem grew. Blending in, in those early days, gave me an opportunity to experience life as incognito as possible, considering I am a six foot tall (and taller in heels) transgirl. As my wardrobe grew, I noticed the clothes I was buying were reflecting my growing confidence and courage. I was buying less clothes that I felt helped me blend in and more clothes that, in the corner of mind, I would wear in public when I felt bolder. It would take another year or so until the outfits I wore outside of the house moved from blending in to being bolder. My wardrobe was expanding and was soon filling up with bright colors, bold patterns, higher heels and skirts that showed off all the hard work I put into on the Stairmaster at the gym. Then one day I was done blending in. I am not sure what triggered it, perhaps it was a beautiful day, or a new dress I couldn’t wait to wear. Soon I was at the mall, at the art museum, getting makeovers and having coffee wearing dresses that I never thought I’d have the courage to wear in the real world. Dresses with bright patterns, eye-catching designs and flowers. I remember the day I wore the outfit pictured above. I was feeling particularly bold that afternoon and opted for a bright, tight pink dress with matching pink heels. I looked at myself in every mirror I saw at the mall that day and marveled how it didn’t seem that long ago when I tried so hard to blend in, to not be noticed. This outfit was about as far away as incognito as one could get. These days I no longer try to blend in. There’s not much in my closet that I am not comfortable wearing. Of course, I still believe in dressing appropriately, I am not going to wear my leather dress and five inch stilettos to the grocery store, for example. Looking back at these photos and remembering the past few years, I am amazed at the confidence I’ve gained in such a short time. One of the reasons I formed the MN T-Girls was to show other transwomen that the world can be scary at first, but it’s really quite wonderful once you are out in it. I understand the need and instinct to want to blend in, but standing out is liberating and amazing. You may be surprised by how the world reacts and even embraces you. There is a hashtag that I saw the other day that reads #wearwhatscaresyou and I really like that idea. The idea of wearing a bright pink dress with sky-high heels terrified me a few years ago, but it’s one of my favorite outfits. To me it screams confidence. Wearing what scares you is a big step, and it took me a couple years to gain the confidence that I needed to do so. But, like wearing high heels, it takes baby steps. Getting a little push doesn’t hurt either. I remember going to Pride and having to stop at the grocery store beforehand. I was wearing a bright pink, polka dot dress to the festival and walking into the store wearing such a eye-catching outfit was a little scary at first. The dress was perfect for a hot summer day at Pride, but very bold for a grocery store visit at 6:30am. However, doing that was one of the little pushes I needed. If you’re looking for a push, you may want to consider ‘Try-Day Friday’, a challenge that was started by Dia & Co, an online clothing company that provides their customers with new outfits that are designed to create confidence and help take fashion risks. Despite many things happening in our country, I am feeling optimistic for our community. We are making progress, socially and politically. It’s not always been easy, but baby steps, you know? I am also excited about your growing confidence. Yes, yours. Do something that scares you, wear something that scares you. I Sure Like to Talk! Tonight I had the pleasure once again speaking at the Minnesota Transgender Alliance meeting. Last month I spoke at the Minneapolis chapter and this evening was the Anoka group. 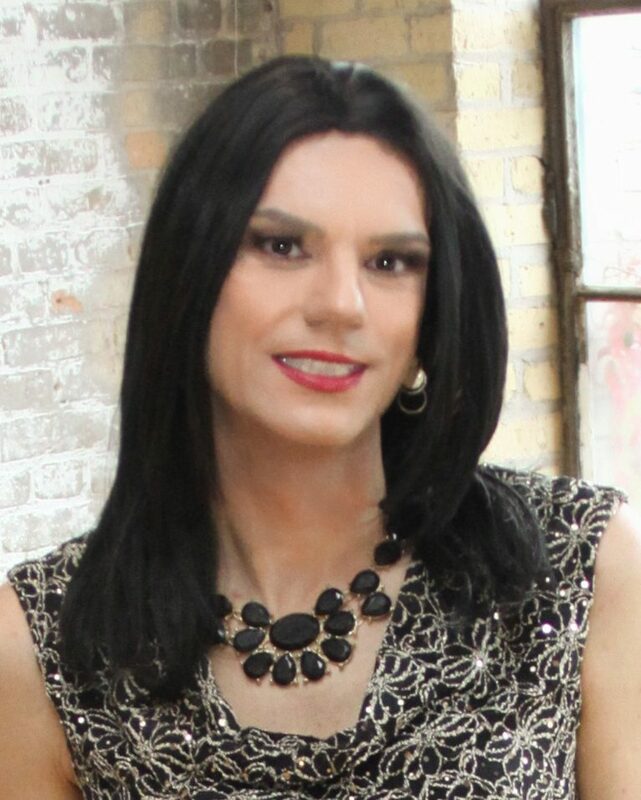 I spoke about the MN T-Girls, my experiences in being transgender in the Twin Cities and, of course, shopping. Thank you to everyone with the Minnesota Transgender Alliance and for everyone who attended!